Grape hyacinths are flowers commonly associated with spring, as they bloom very early in the year. They can be planted in many different fashions, both indoors and out. You can incorporate muscari bulbs into a formal border for a neat, classical look or create a large block of colour – a technique used at Keukenhof. Should you ever need any extra inspiration for your garden, Keukenhof is certainly worth a visit. Planting muscari bulbs is fairly simple and does not differ much from planting other bulbs. Because muscari bloom so early, they must also be planted earlier. So be prepared to plant your muscari bulbs as early as September, as this is when they will start to grow. When planting, dig a trench that is about twice as deep as the bulbs are tall. Plant your bulbs at the desired distance to each other and cover them with earth. Always plant flower bulbs with the pointy end facing upwards, as this is where their flowers will grow from. Water you grape hyacinths after planting, but after that just let nature do its job. Muscari are also excellent potted flowers. During spring, you can but potted muscari bulbs at most garden centres. However, most bulbs on offer will be the same kind. 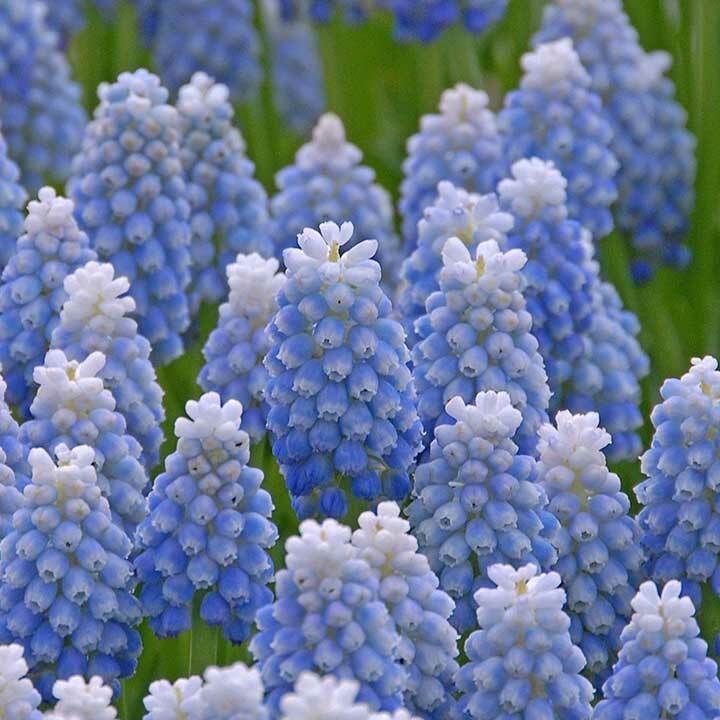 Our assortment includes rare and unique types of muscari, for example muscari ‘Peppermint’, a striking two-tone variety. 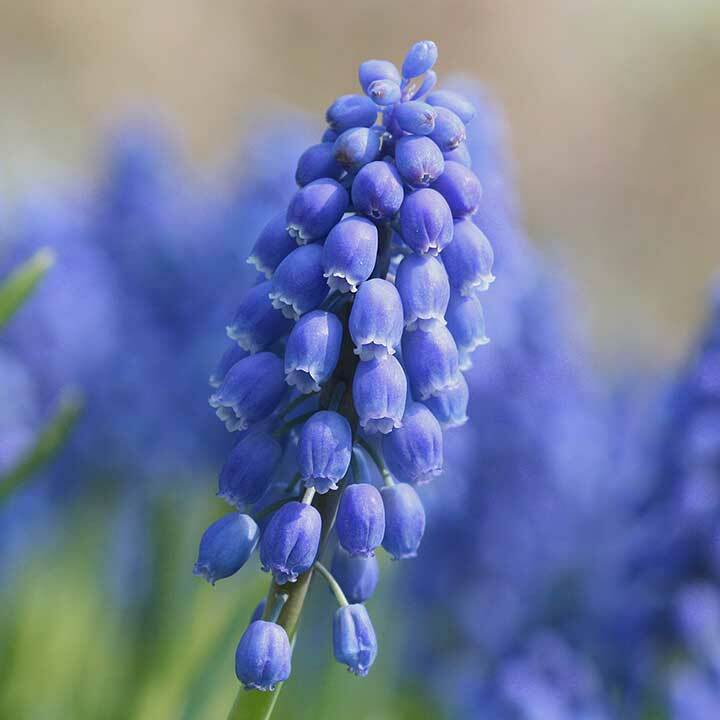 This will allow you to create your own mix of grape hyacinths for your home or garden. You can even mix you muscari bulbs with other spring blooming bulbs, such a s daffodils, for a truly striking effect. The possibilities are endless when you use your imagination! 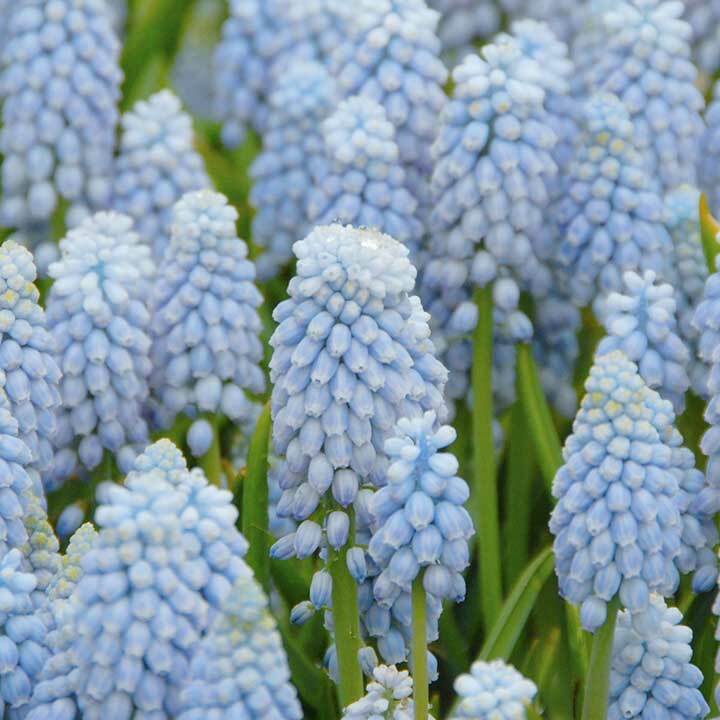 Buying muscari bulbs online can be done quickly and easily through the Fluwel.com web shop. This means you will have more time for important things, as time is money in todays world. Still, enjoying the little things in life should not be underestimated. A lovely display of spring flowers waiting for you at home or in your garden will certainly brighten your day. Muscari are small enough to fit into almost any border or flower bed, but will still grab your attention and add interest to your garden. After receiving your bulbs, you can start planting immediately, as we always ship in time for the planting season. We also offer plating tips for all kinds of flowers bulbs. So finding a spot for these charming spring flowers and planting them successfully should be a breeze. The reward will certainly be worth your time. Would you like to see more of our bulb flowers? Take a look at our daffodils, tulips, alliums, amaryllises or crocuses.